Nice attention to details Dennis. Thank you for your nice remarks. Thanks to a public holiday here in Germany some further work could be done on the Panhard. I first sanded down the additional sheet on the tires. This went pretty smooth even if some putty will be needed. I than took care of the suspension and the axles. 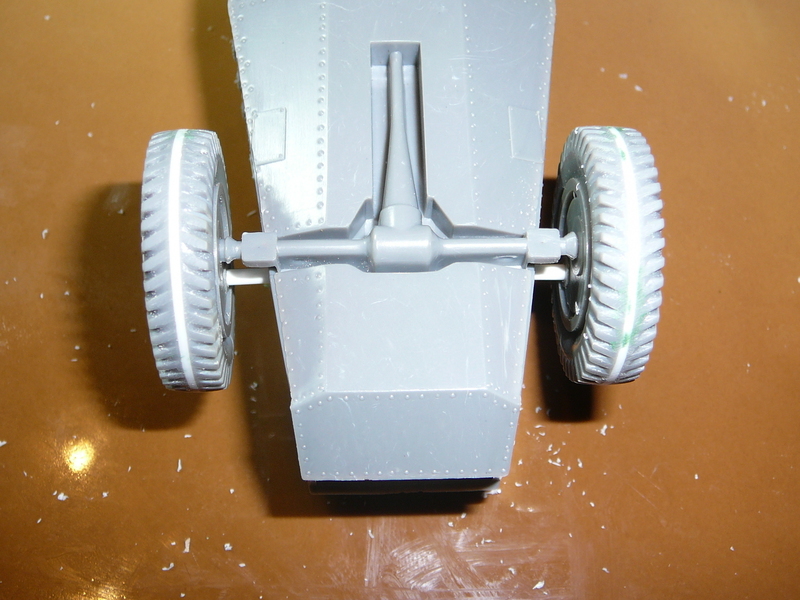 ALBY did use a two axle-system on the wheels with one axle attached to the tire and one to the suspension. Unfortunately the axle attached to the road wheels are too short which means that the have to be replaced. 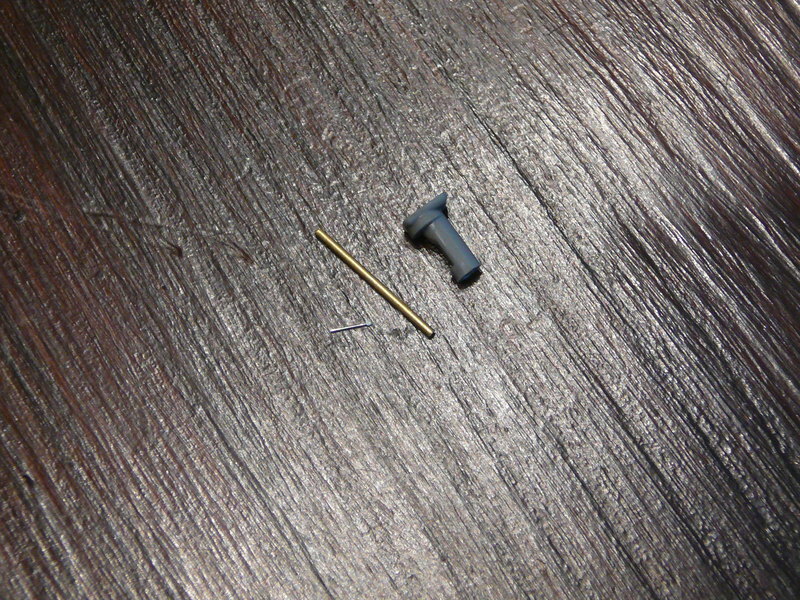 The first step was to cut the original axle of the tire and drill a hole in its place. 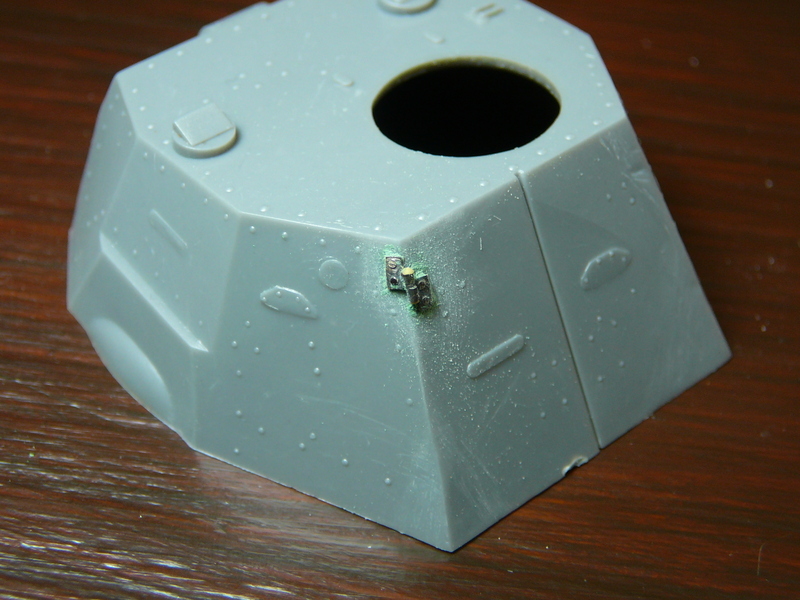 The small recess in the hull which should take the axle was drilled into also. 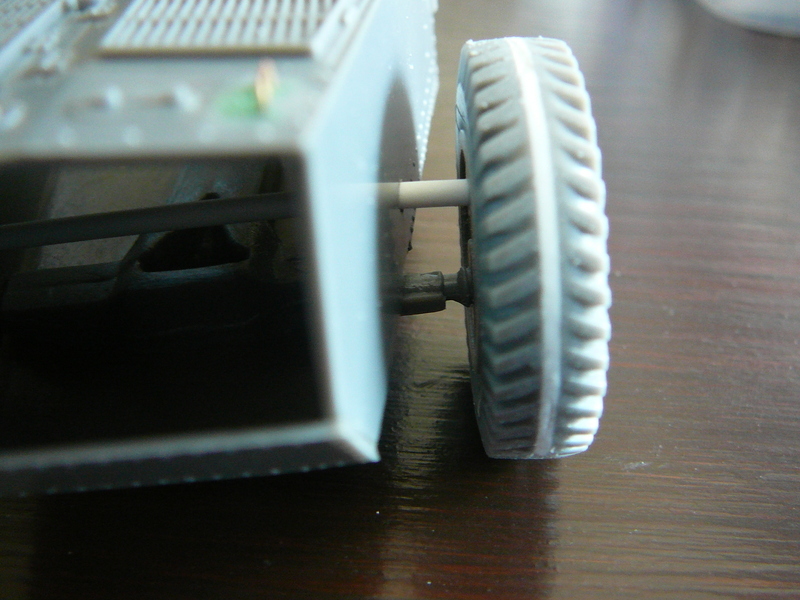 Afterwards some plastic rod of appropriate diameter was inserted and replaces the original axles on the wheels. You can see some Squadron Green Putty on the handles. In delicate places sanding gets much more easier with a glass fibre-sanding pen. I will show one later. 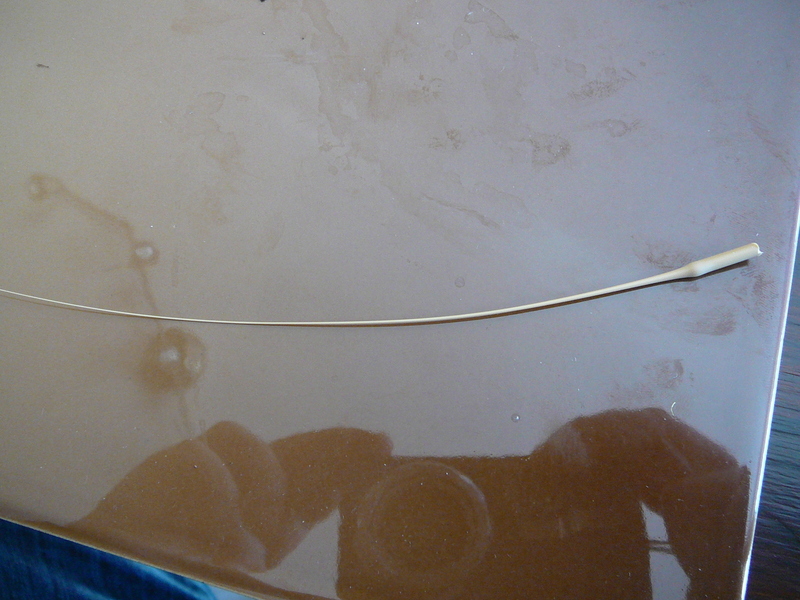 As you can see, I did use one long piece of rod which got pushed through the entire hull. 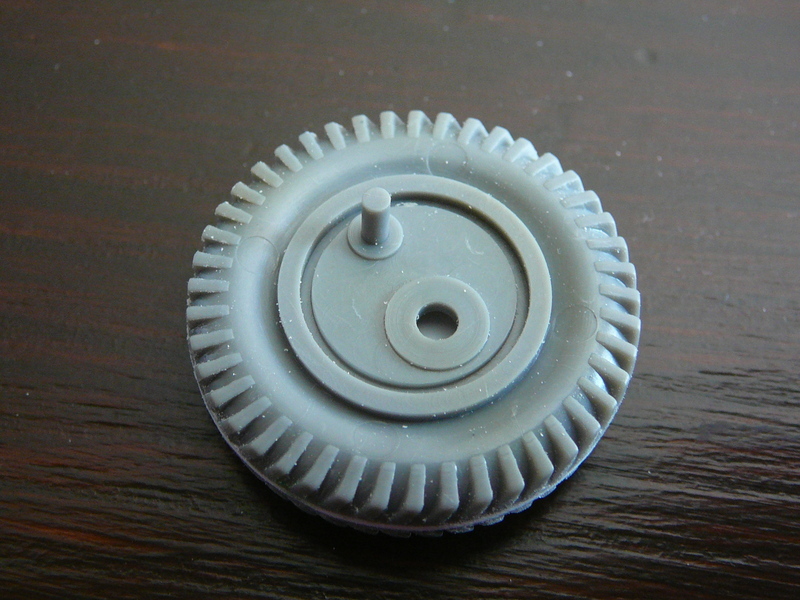 Don`t be a cheap one here, as one long part will make it much more easy to align the wheels and give more stability than two seperate pieces. 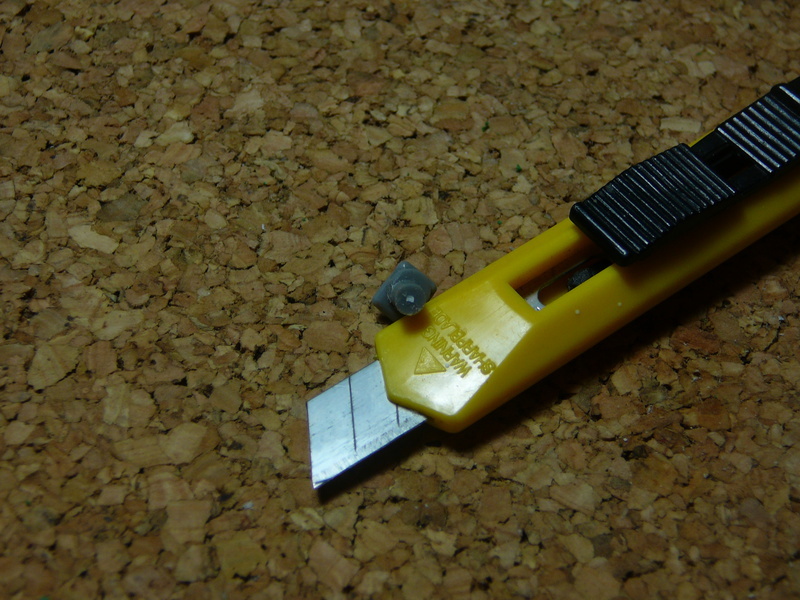 I won`t risk a cardiac arrest for the sake of some 2-cents plastic rod. The wheel finally fitted to the new axle (not glued yet). When working with rods I usually use a drill a minimal bit smaller then the rod I want to insert. Afterwards a take a rounded file to widen the drilled bit slowly until I have a tight fit connecting the parts even without glue. This way you will get very sturdy parts. 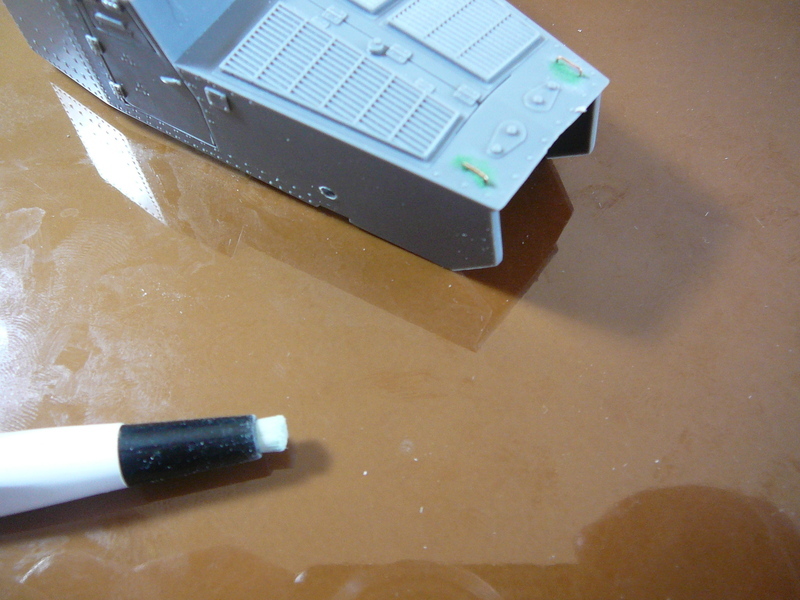 The fibre glass pen used to clean up putty under the handles. I could have done better but wanted to make the picture today. Will be cleaned out better afterwards. 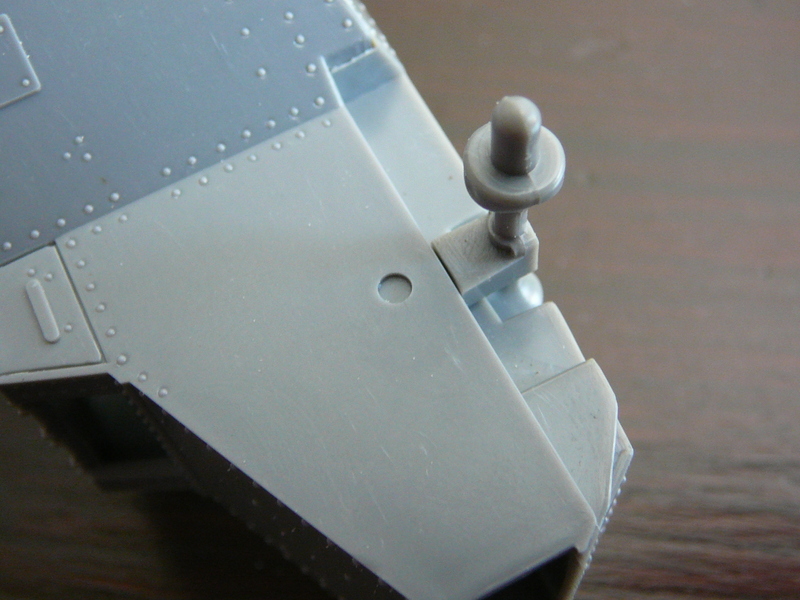 The next major grueling task was to replace the hinges on the back of the turret. 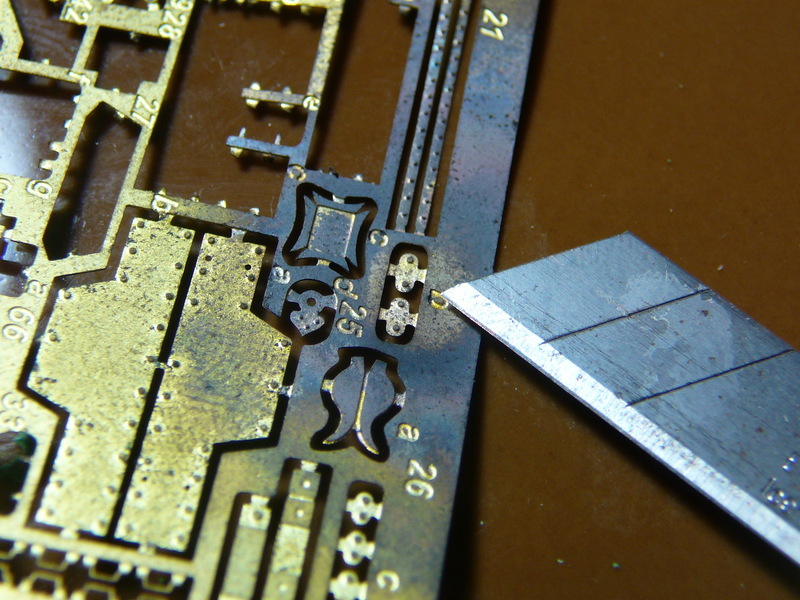 Rather large parts in a prominent area which therefore absolutely had to be redone. 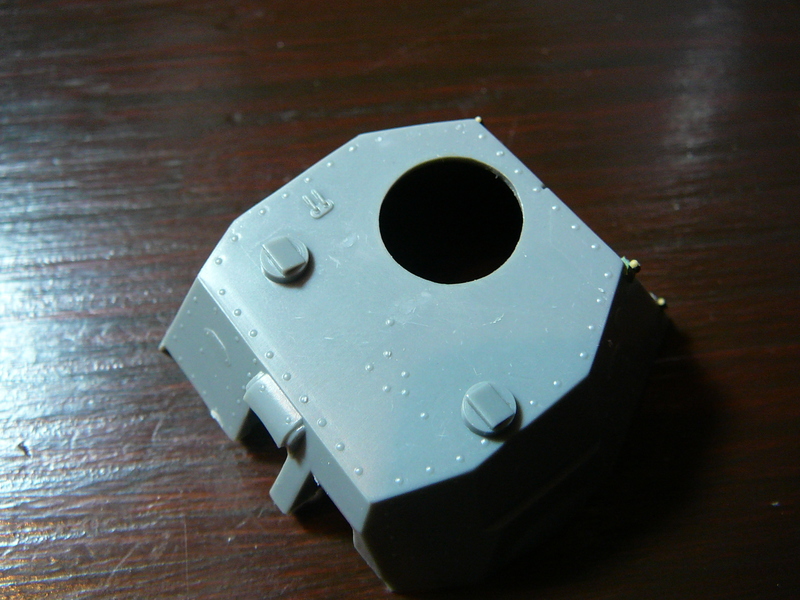 I started by removing the hinges from the turret. 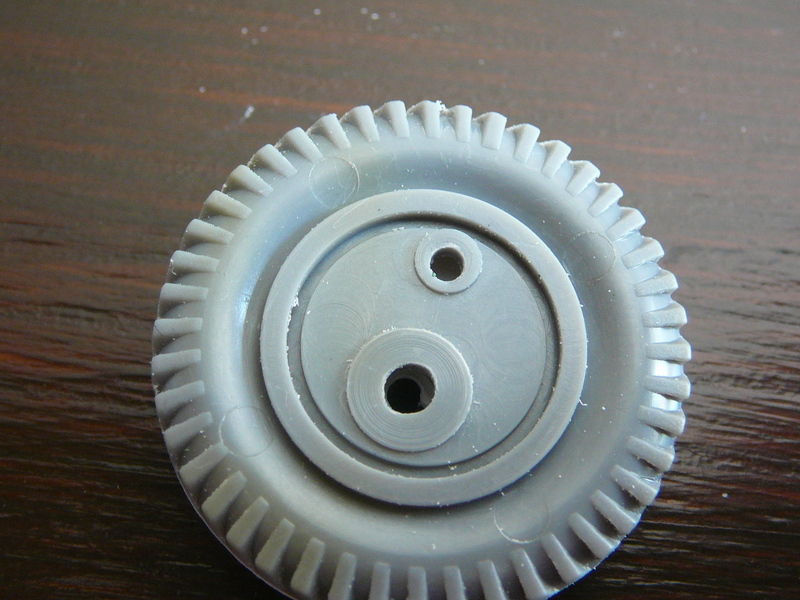 If you work with PE-parts you always should remove plastic parts only if you have prepared the PE parts. 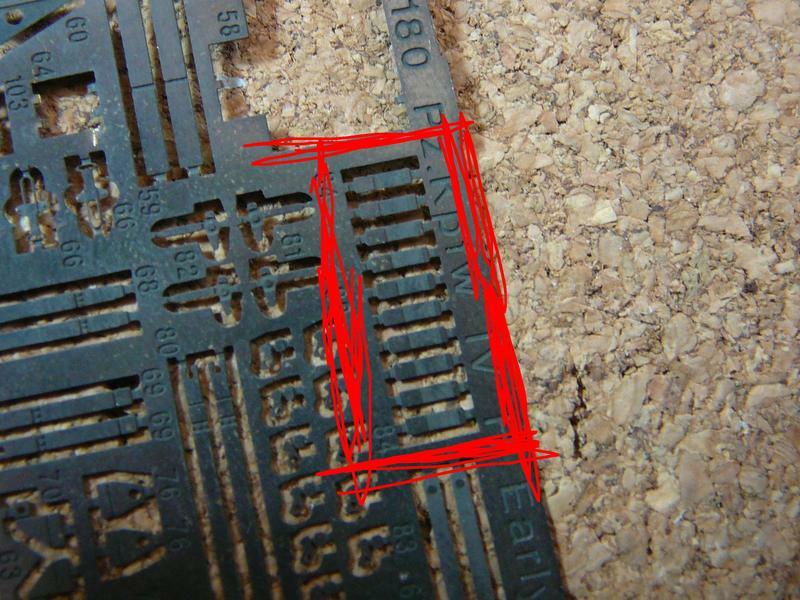 Otherwise you are in trouble if you fail to construct complicated PE parts. I had all PE ready before cutting something away. 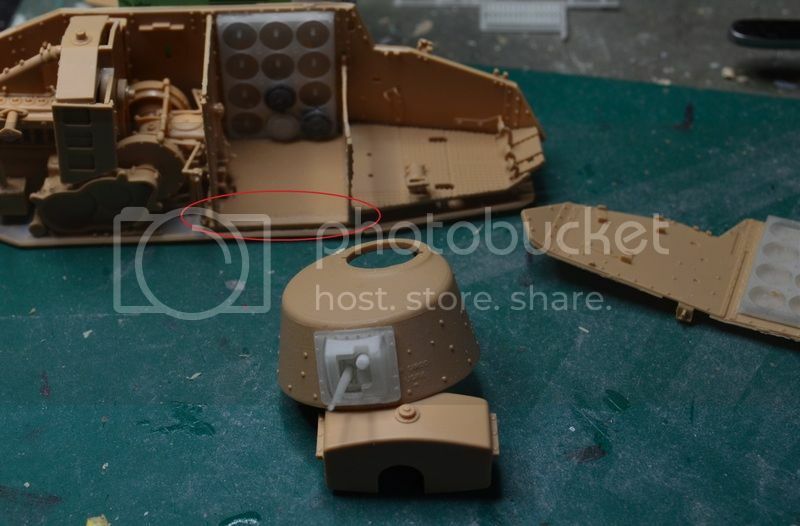 As I am not aware of some aftermarket PE for this kit I simply went trough the modeling garbage and collected some old PE sprues for a Panzer IV. 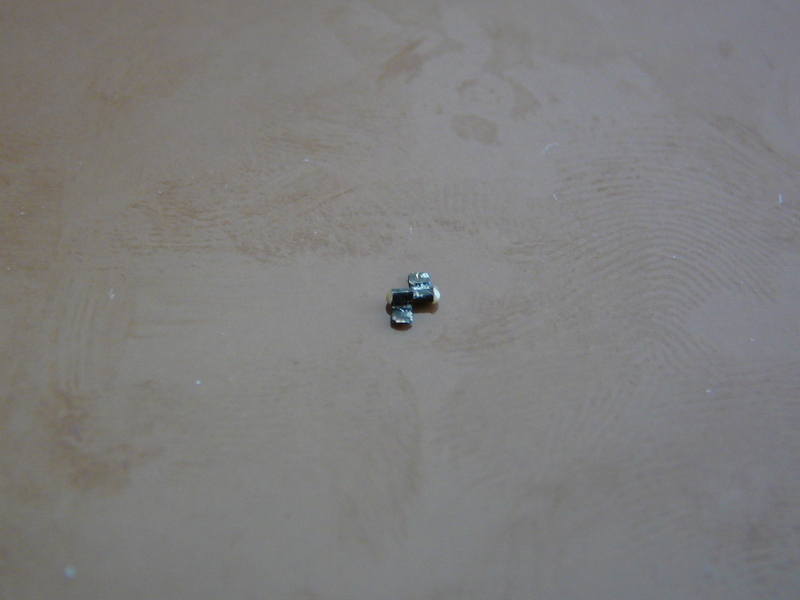 I removed these parts from the sprue, annealed them and pre-bended them. Anealing the parts will help you to bend round or curve shapes. 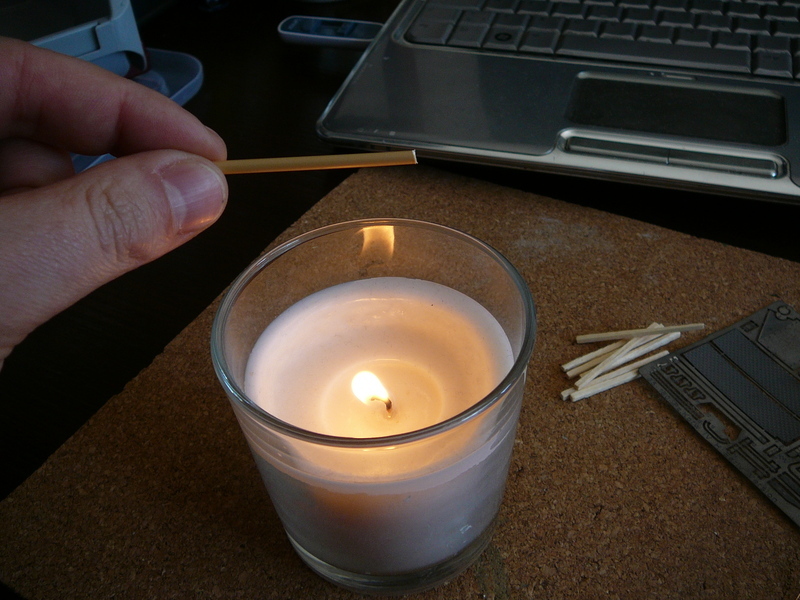 I stole one of my girlfriends candles (got the vanilla one... ) and startet to heat some sprue, tearing it to length. 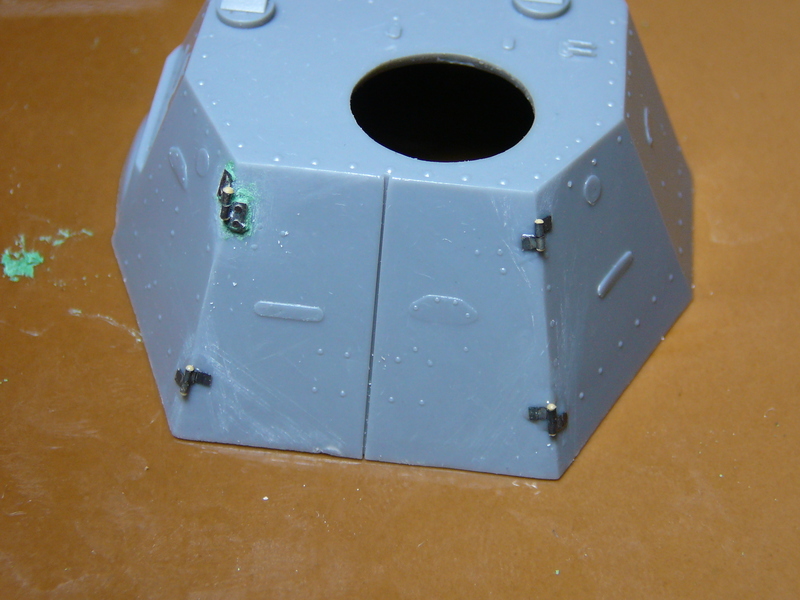 The next step was to bend the PE part around some sprue to make the hinge. 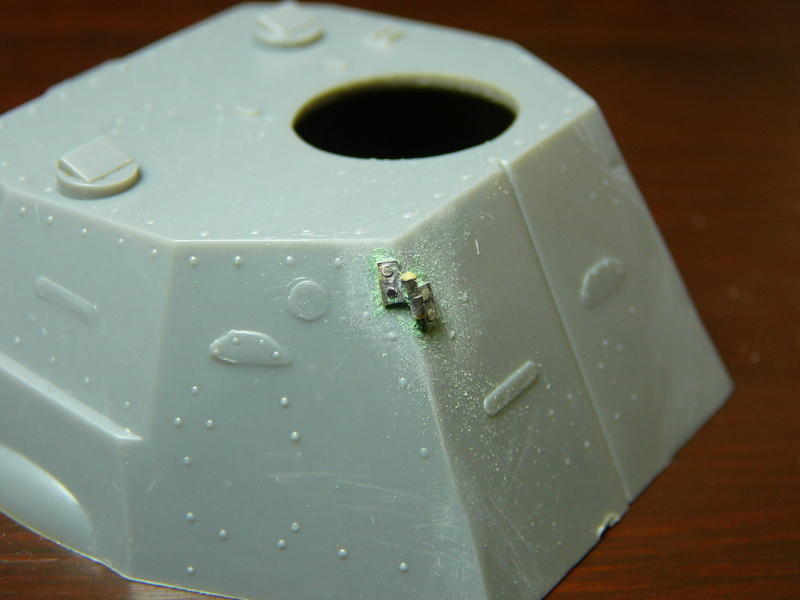 I left around half a mm of sprue on each side. 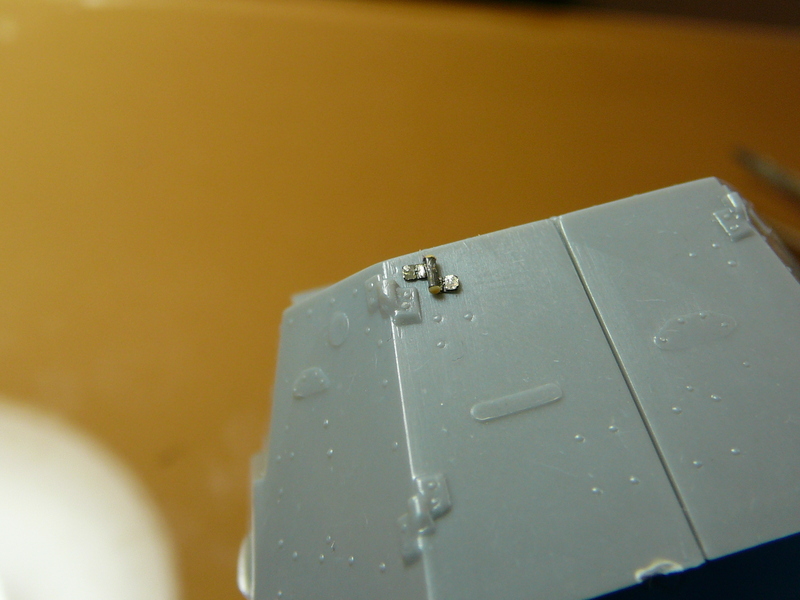 While holding the hinge with some tweezers I approached the excess sprue with a burning match slowly until the typical rounded bolthead often found on hinges formed from the melting plastic. This way you get the typical look of a hinge. The whole thing is holding together without glue and is movable. 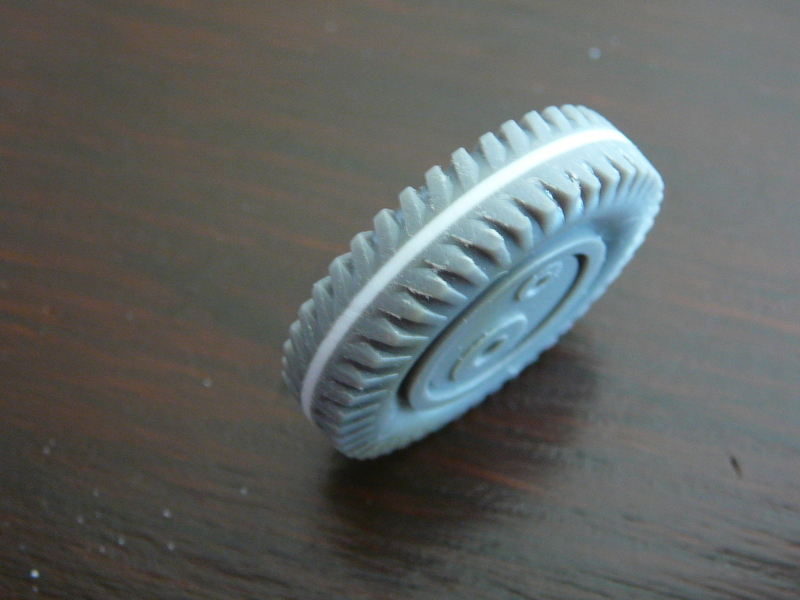 This comes in very handy when fixing it to the turret. 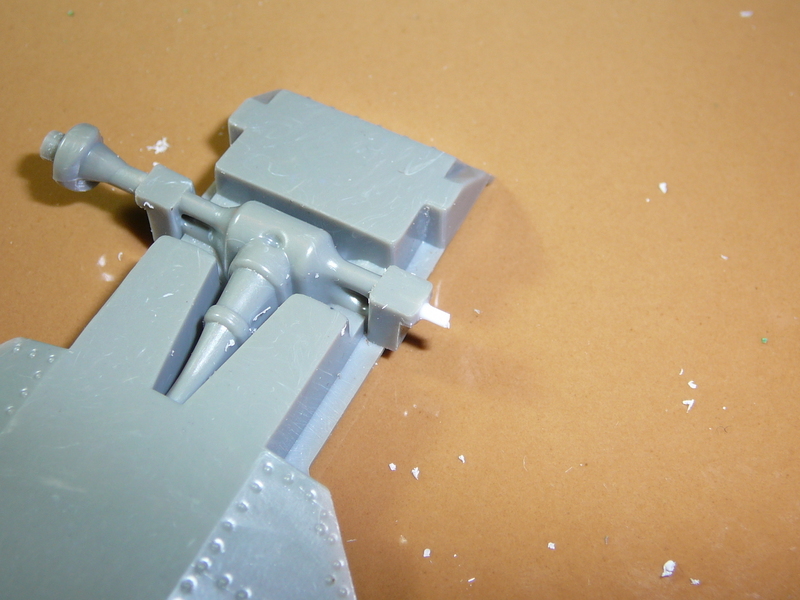 The next step was to cut some spare PE and glue it next to the hinge wings to form a small "PE foundation". 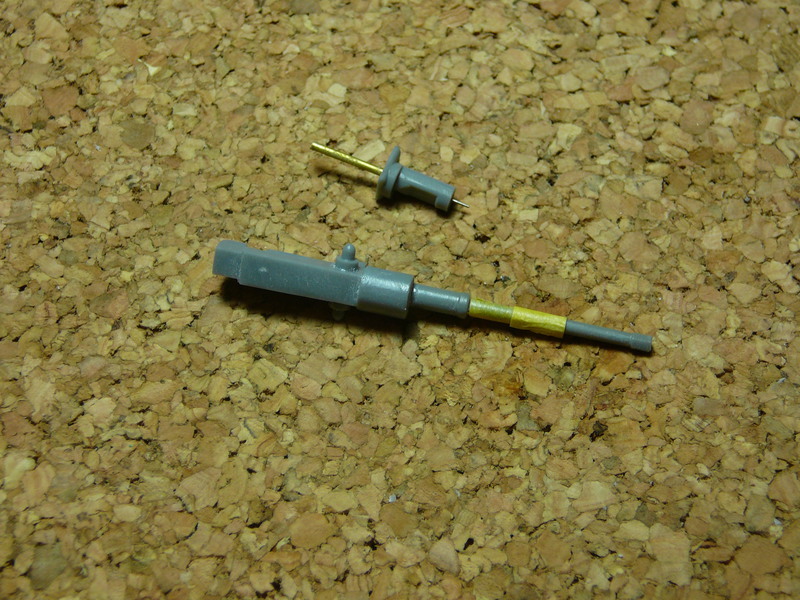 I then collected some PE parts from another kit and did cut them on the green line. This way I got 8 small plates with bolt detail. 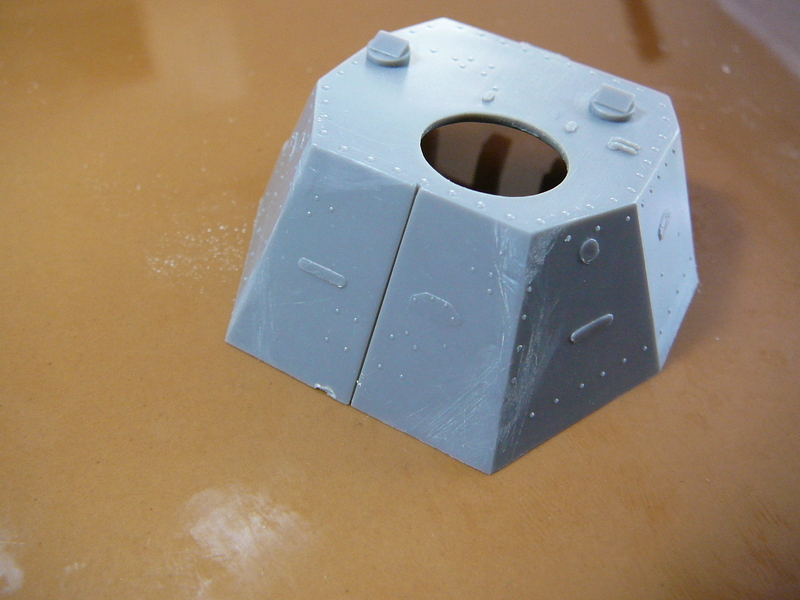 I simply glued these on top of the PE foundation,applied some putty and cleaned the putty with a brush. 3 to go. The hinge will be cleaned and sanded another time after everyting has settled. 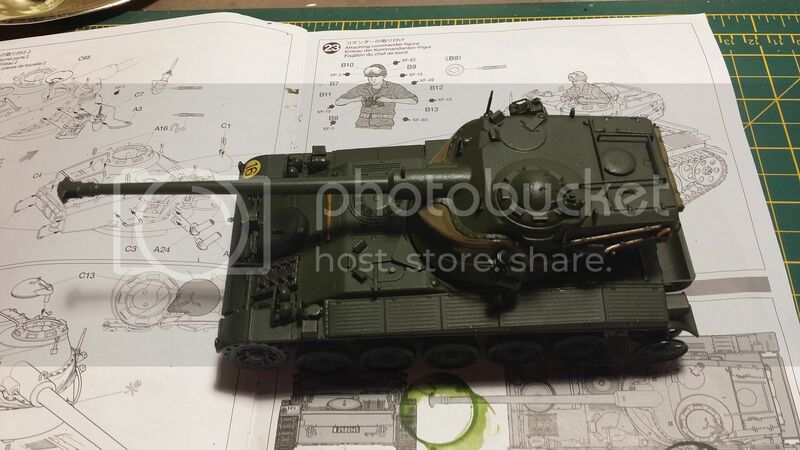 Looks very coarse now but nice on the model. Still need to clean it up a little but I am happy with the result by now. 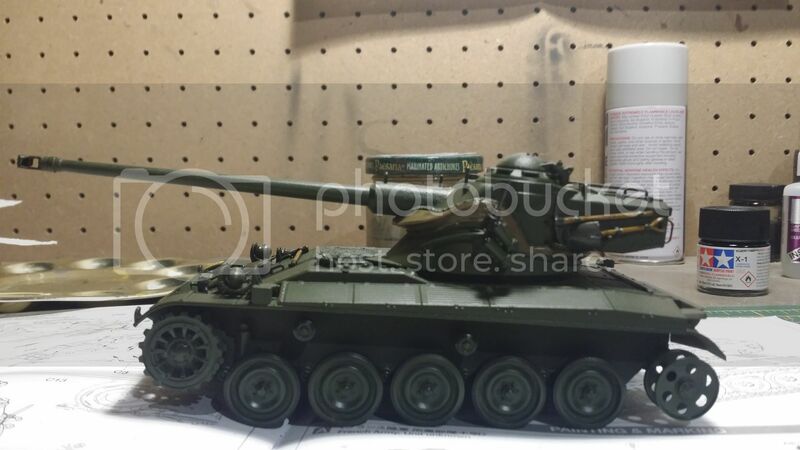 Holy smokes very nice scratch building! I'm learning a lot from you. 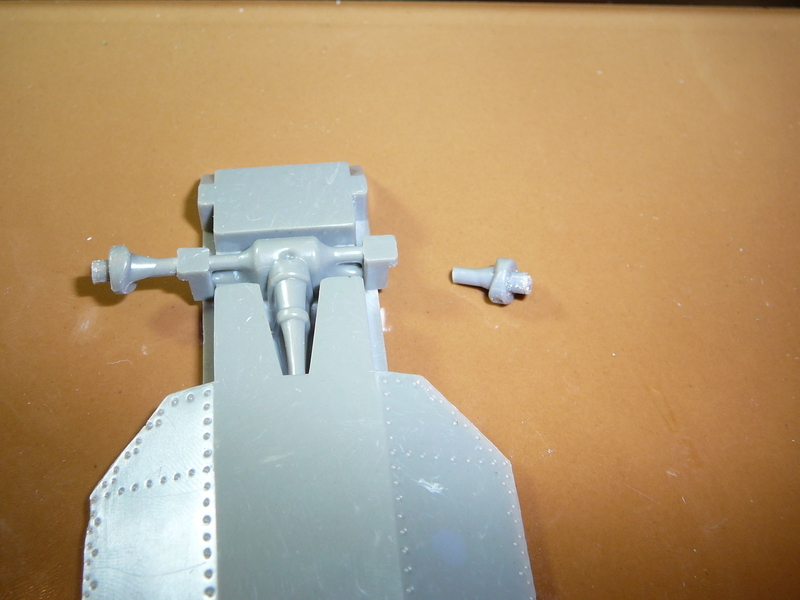 You are right the kit hinges were pretty bad. Can't wait for more. 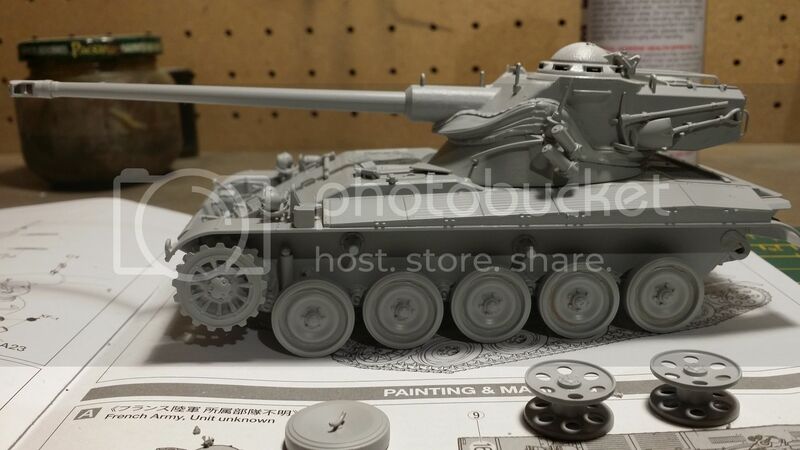 Primed and ready for paint.Really don't want to use the rubber band tracks so I preordered the Takom indies for this kit. Nice! What green did you decide on? 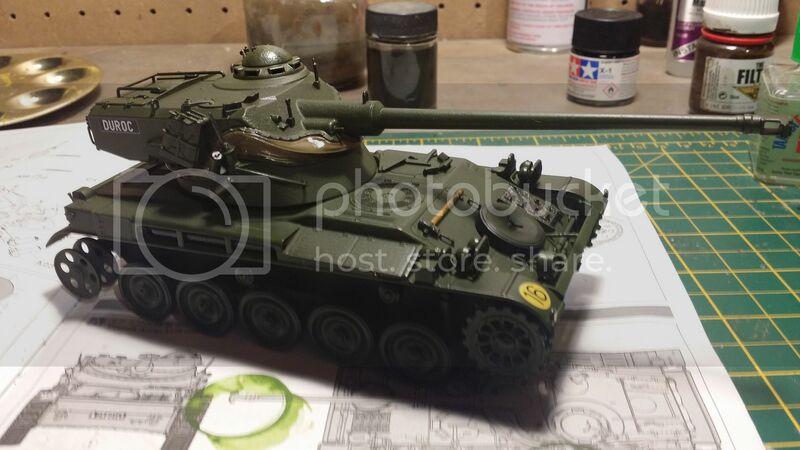 Thanks,Taffy3 is doing a build blog also and he recommended Modelmaster Med Green 34102 I think it looked pretty good. after a short trip to France (Verdun) I decided to get some things done on the Panhard. 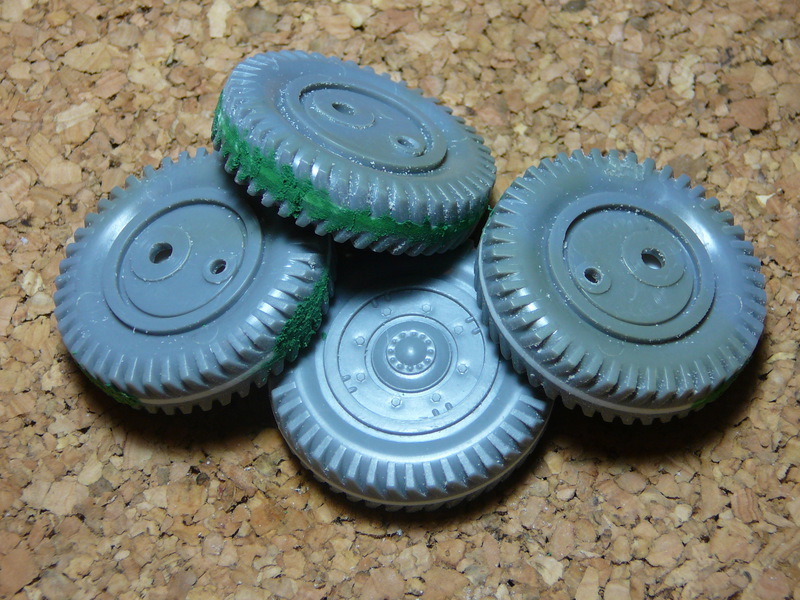 First I applied some Squadron Green Putty on the tires as these had some dents here and there from scraping down the additional plastic discs. Afterwards I gave them some sanding with a coarse metal file and some fine grit sanding paper. The remains of the putty will be brushed away with an old toothbrush or cleaned up with some toothpicks. 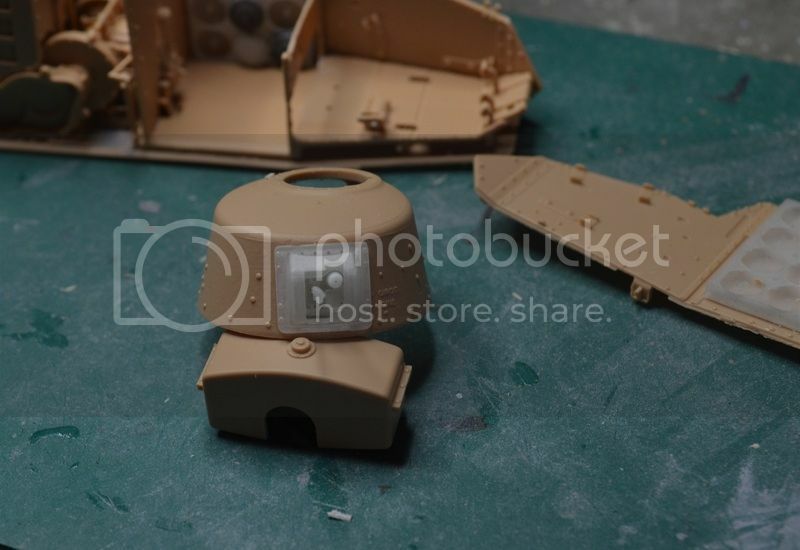 I have by now built all 4 hinges for the back of the turret.As I had some trouble with fast drying CA glue, even as I have used the gel type, I decided to use two parts-epoxy glue to get some more time to adjust the remaining 3 hinges. 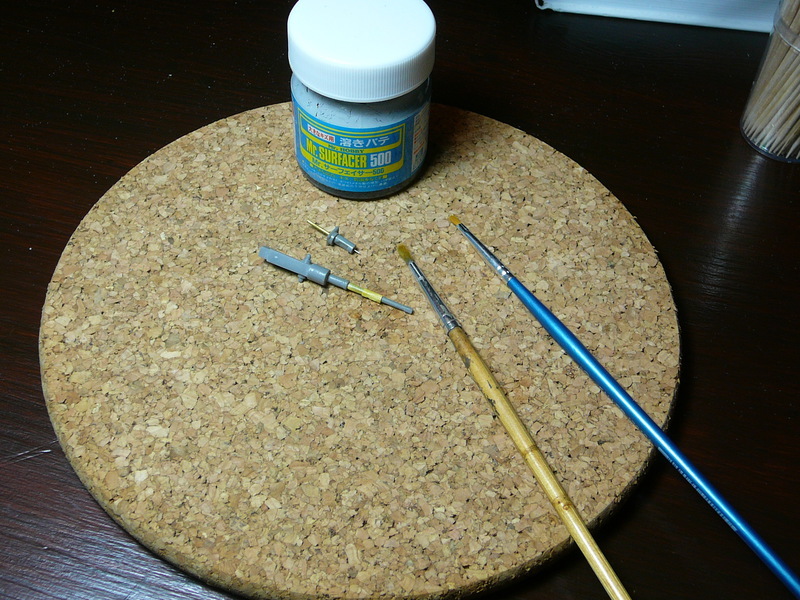 As the glue needs some more time to dry thouroughly I could not add the additional parts by now. 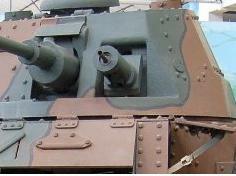 The next parts were the 25mm autocannon and the machine gun located in the turret. The original parts are rather ugly birds. Therefore I decided to give them some additional work to. 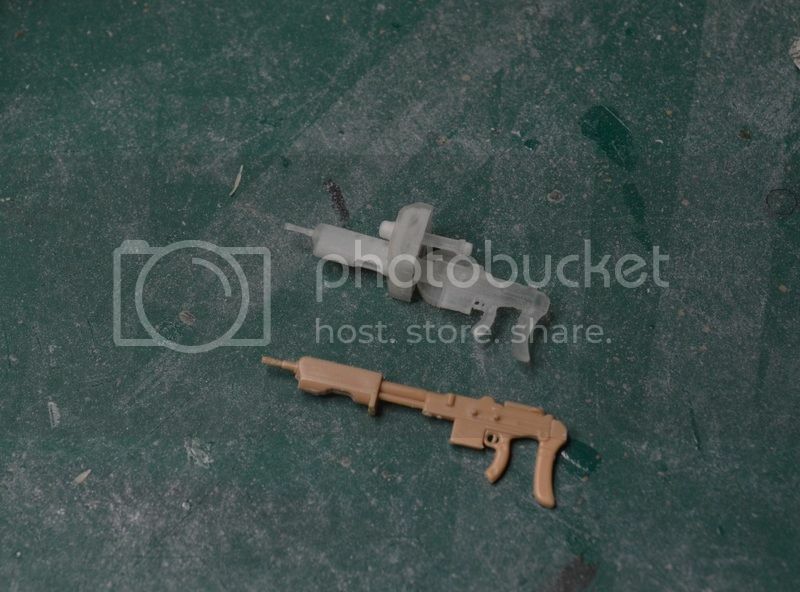 As the casings for the MG and the main gun were made from cast parts, I decided to replicate some cast structure by using Mr. Surfacer 500 and some old brushes. 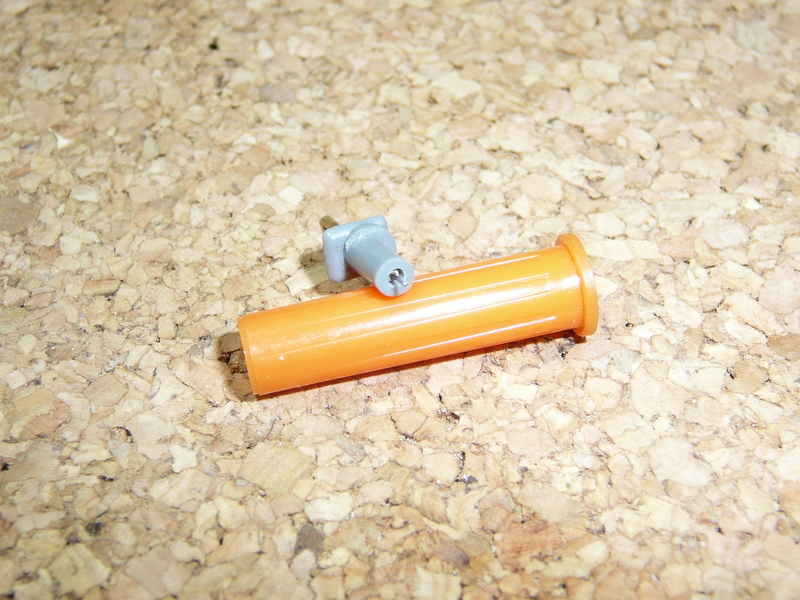 ...to protect the barrel from the Surfacer. This looks rather nasty but the cast effect will show after sanding the whole thing. I did simply pick up some surfacer with an old flat brush and started to stipple it on in small circled motions until everything had been covered. Now it is time to let the whole thing dry. 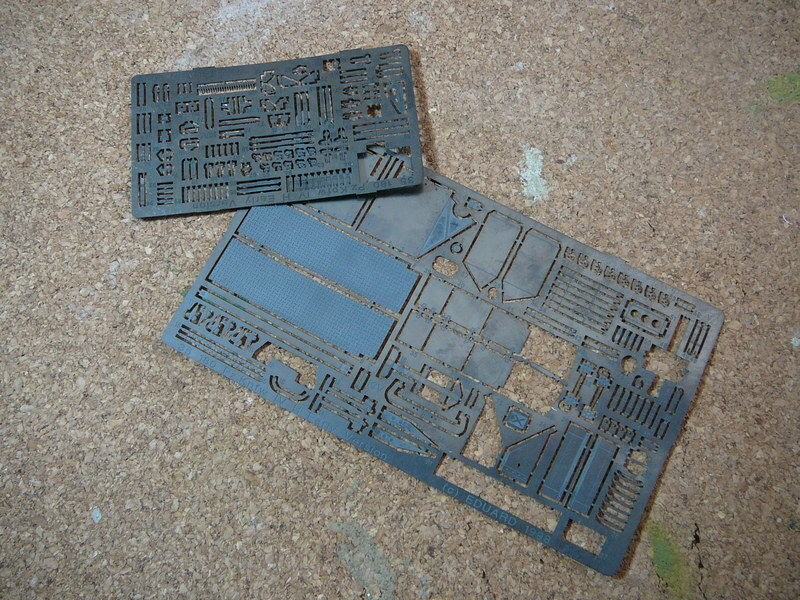 ...this is how the kit part looks like. I cut off the barrel and sanded down the remains. 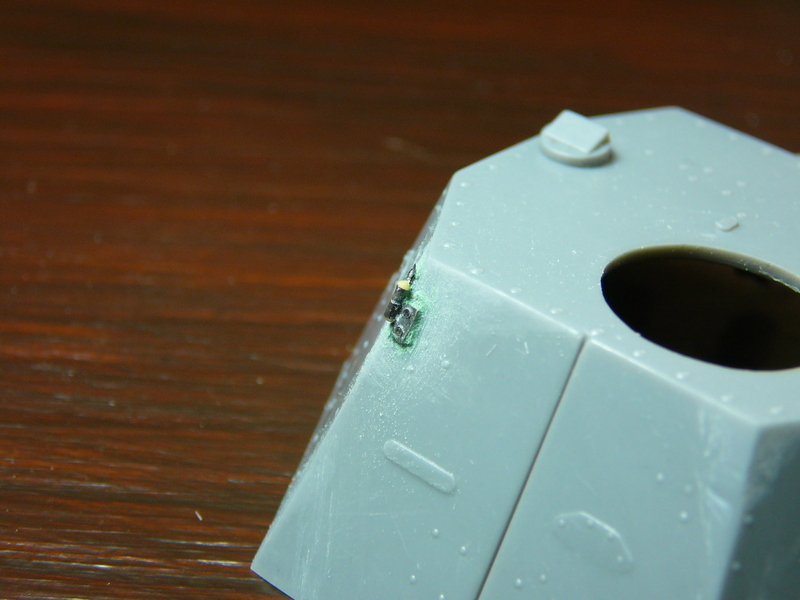 Now one can see a bright grey spot where the plastic broke. 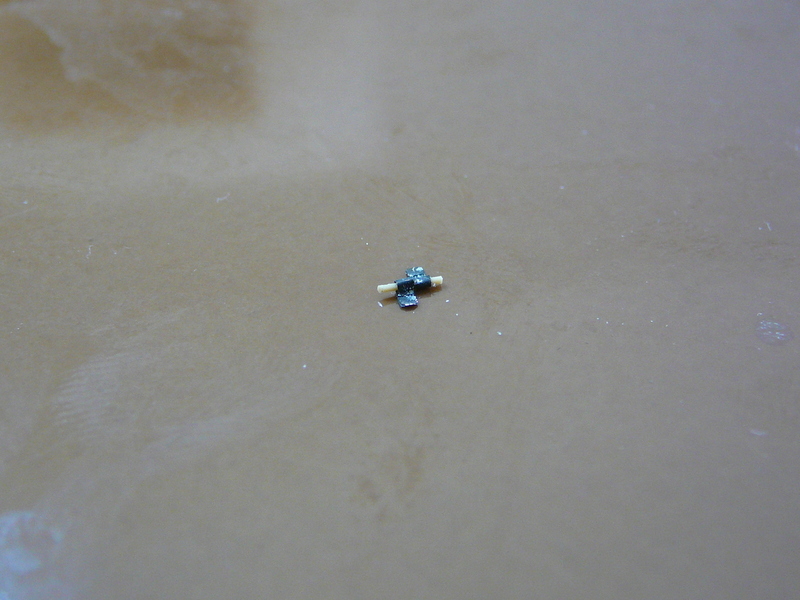 I used this spot as a reference to adjust the drill and did bore a small hole in the part. 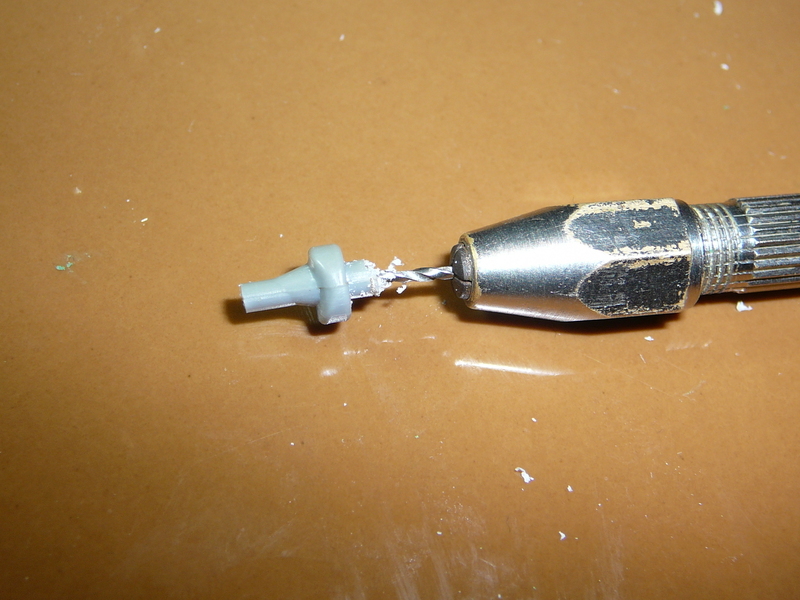 Afterwards I used a smaler diameter drill to bore a second hole which would take a small bras rod. 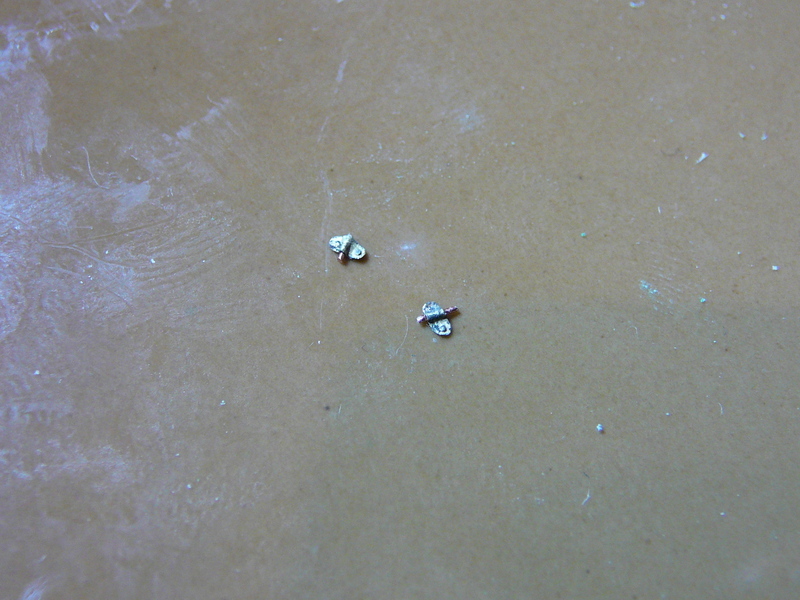 The first hole was unneccessary as it has been widened with the second, larger drill. But it did guide and center the larger drill. 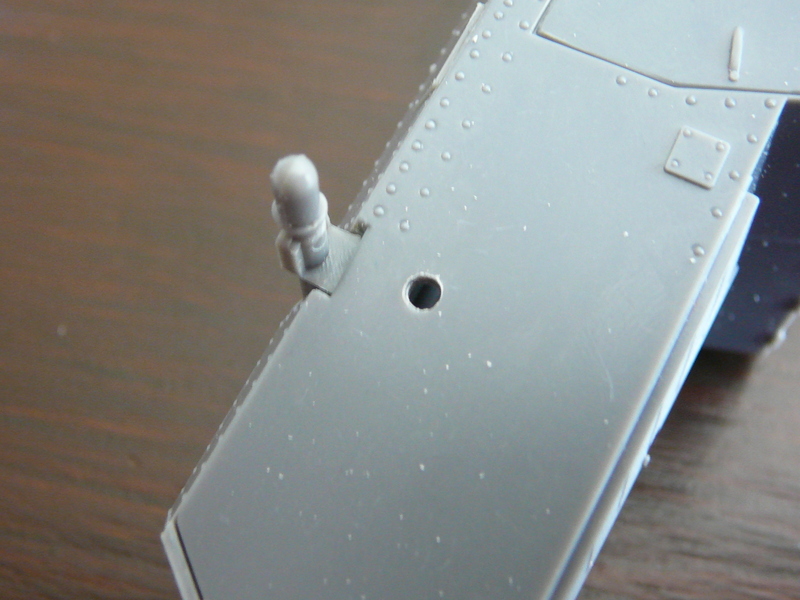 If I would have made a mistake, a smaller hole would have been easier to repair as a larger one also. 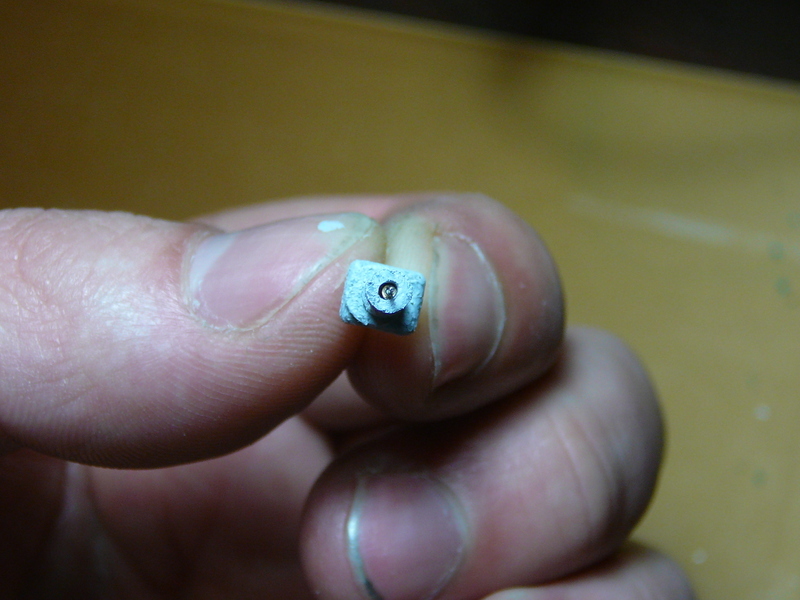 So, start with a small drill and slowlyadjust the diameter with larger drills until finished. 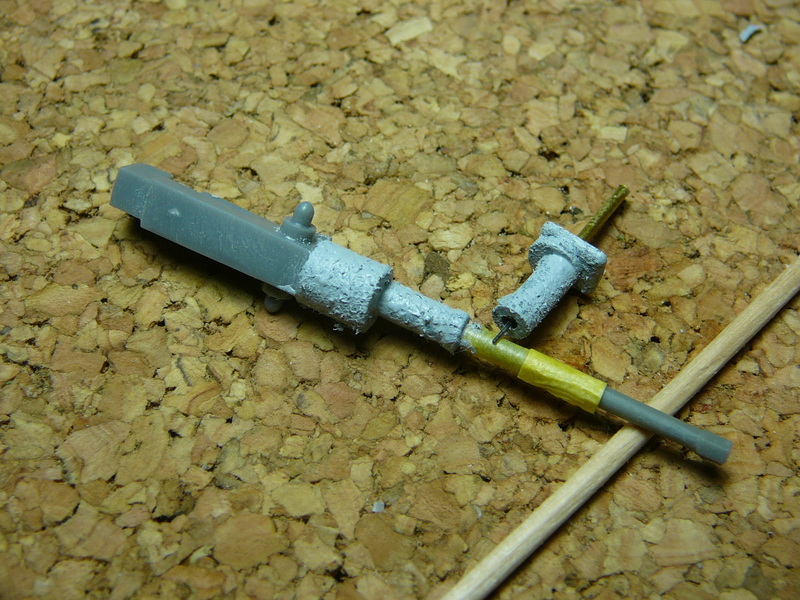 The next step was simple: I did glue the brass rod into the barrel sleve until the small recess formed. Afterwards the syringe was glued into the rod. 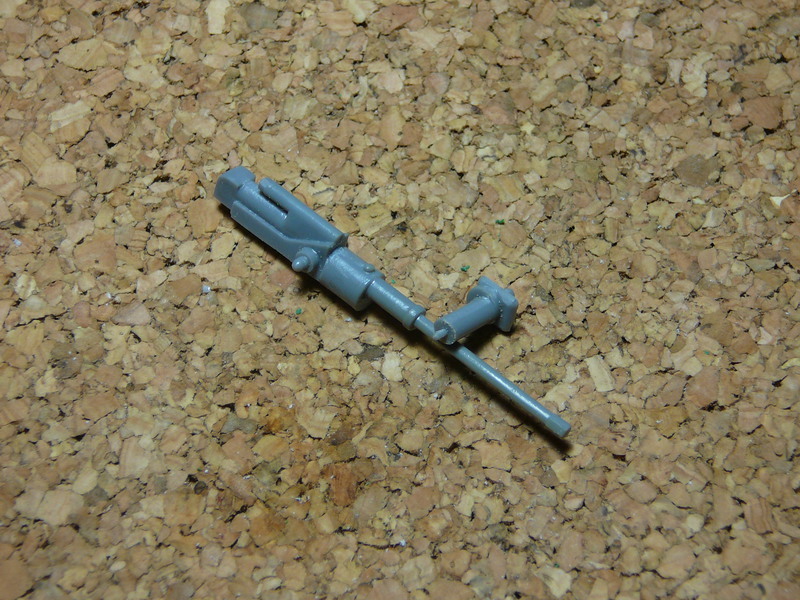 Here we go: barrel with recess....I played with the idea to replace the barrel of the autocannon aswell. As I could not find some rod with the appropriate diameter in my "warehouse" I decided to skip the decision to a time after I have primed the barrel to see how it comes out. The MG sleeve by now. Thats it for today. It is midnight here in Germany so I will get some sleep. Thanks for watching. 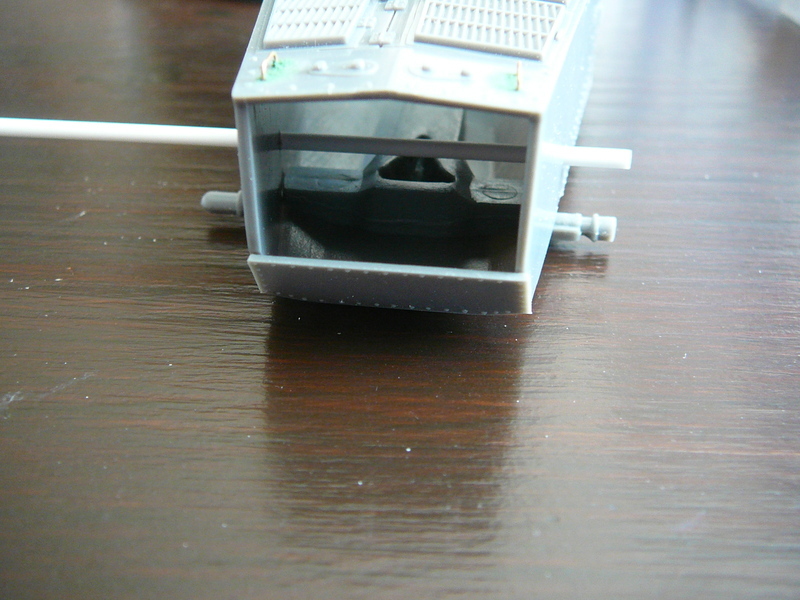 The next things I wanted to detail are the annoying "hinges" for the turret top hatch. These are simply some plastic blobs. 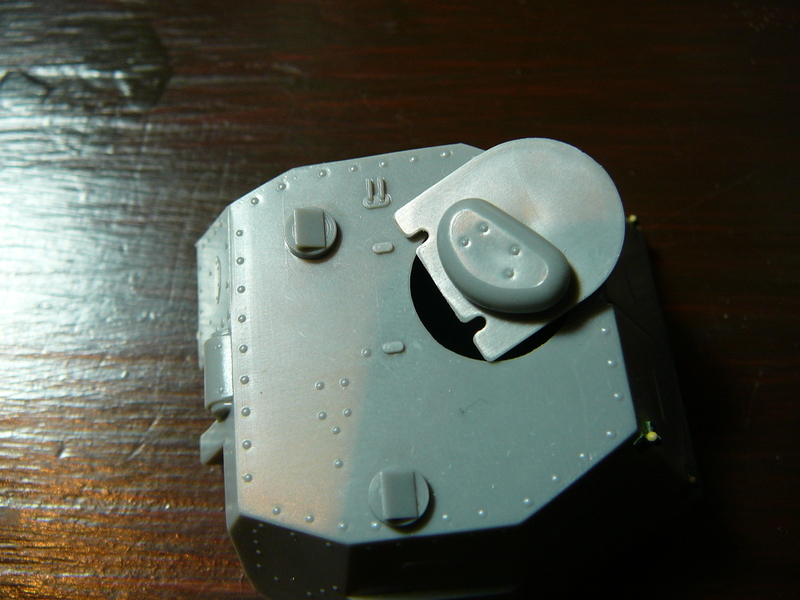 Detailling started by removing these parts and cleaning the turret top. Once again I noticed that it is indeed pretty comfortable to maintain a decent spares box. 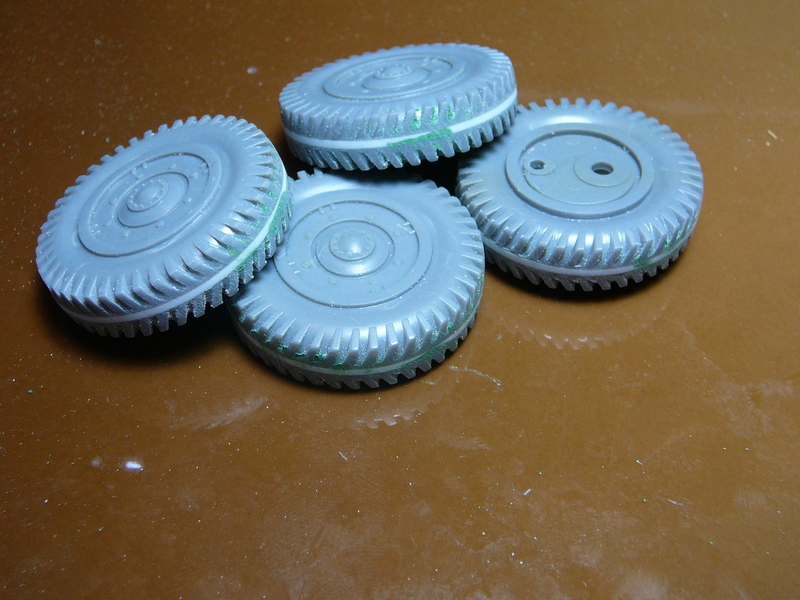 I roamed through my unused pe-parts and annealed the two chosen parts.These had the right size and some etched rivets on top. Just what I needed. Keep spares!!! 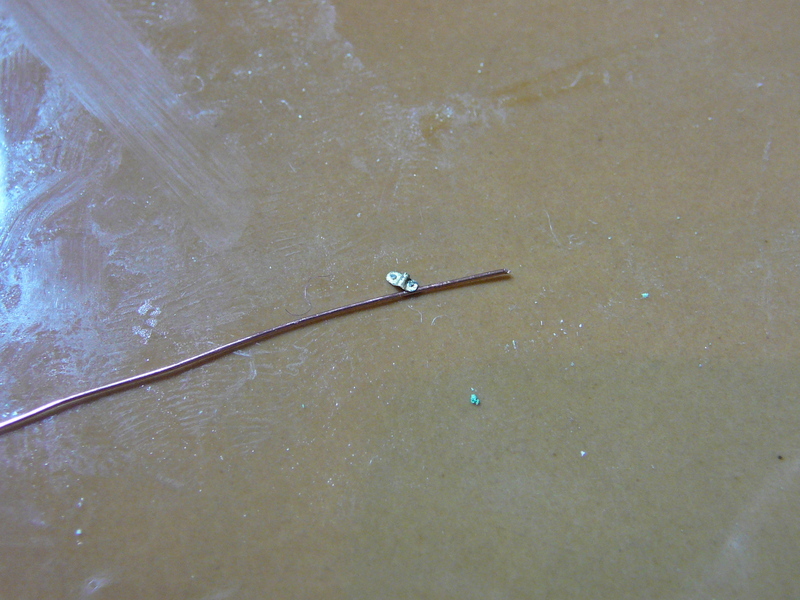 Once again I simply rolled the parts over a lenght of wire until they took the desired shape. 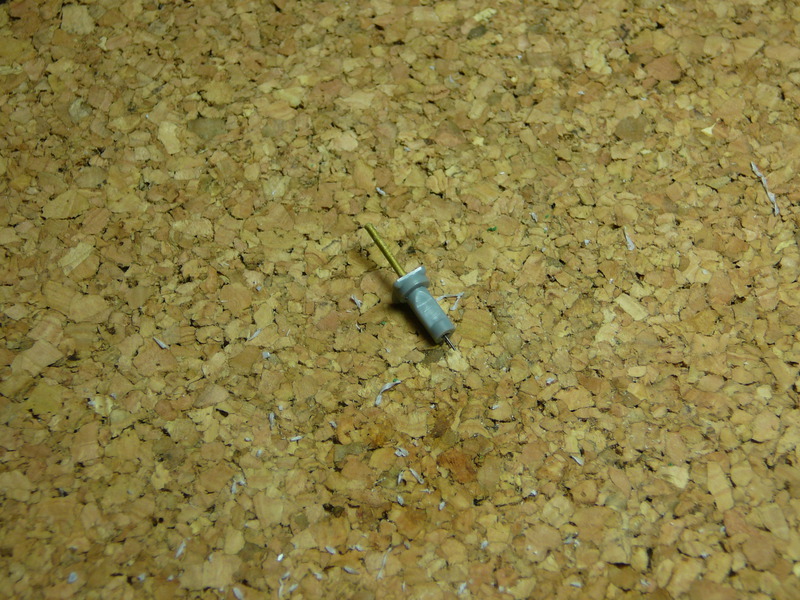 Afterwards I glued the pe-parts onto the wire and did cut the wire close to the pe-hinges. 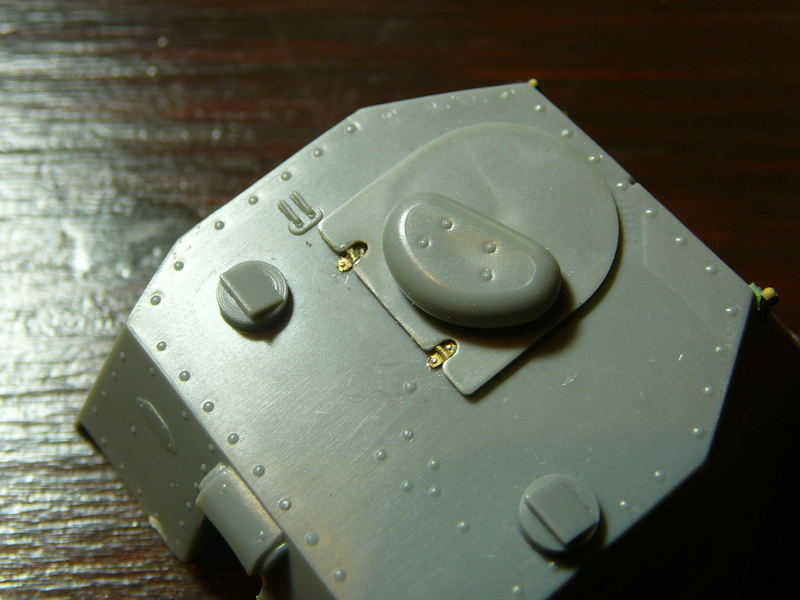 Then I started to sand down the excess wire until the part barely did fit into the locating holes of the turret hatch. By sanding them down step by step and dryfitting them several times (still takes only 30 seconds per hinge...) one can ensure a tight fit and avoid free spaces between hatch and hinge. Afterwards the hinges have been glued using CA. 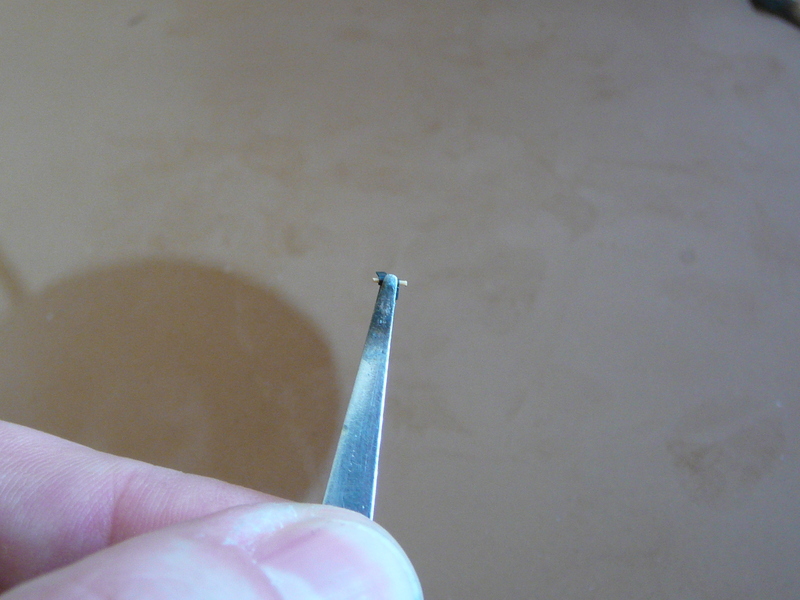 I did use some sharp tweezers to press the pe-parts onto the glue to ensure a nice connection. Thats how the hatch looks now. It looks out of shape here and there and some things could have done better, but some small parts are indeed rather hard to build. It could be better sometimes, but I try hard. The main idea is: it hopefully still looks better than the original parts. Room for improvement is yet still there, of course. Have a nice evening all. Very nice indeed Dennis! I used your technique of glueing wire grab bars on the inside of the hatch so you can't see the glue. Came out great! I wish I had seen your post earlier as it was too late to do the drivers hatches and phone box...oh well. 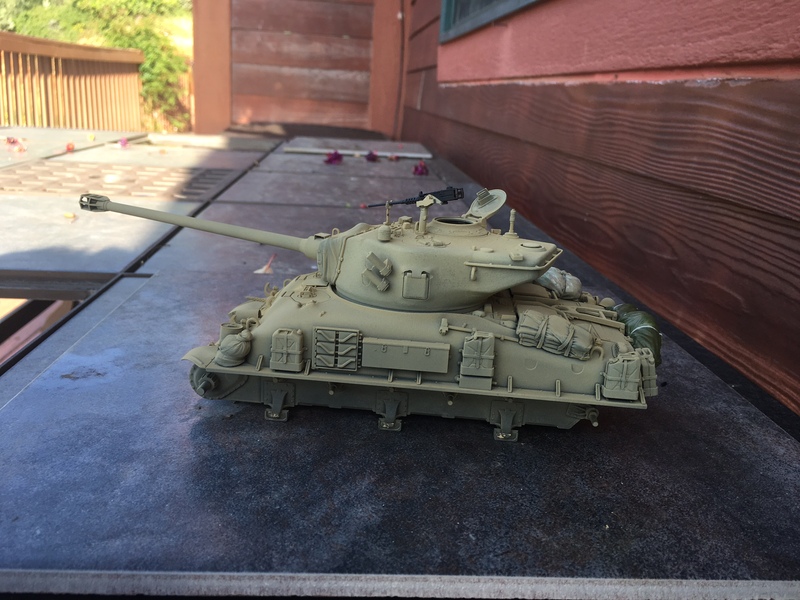 On the Fighting Frogs front I have managed to build both track runs for my AMX 30. 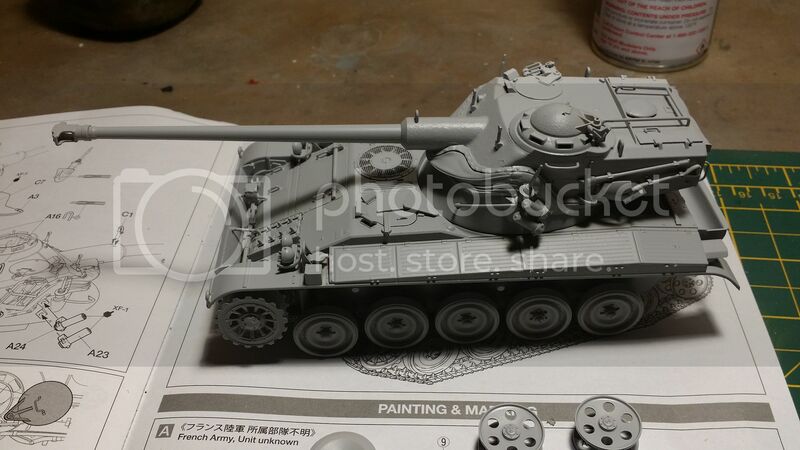 As soon as I finish my Tamiya campaign entry I will really be able to focus and make some headway. 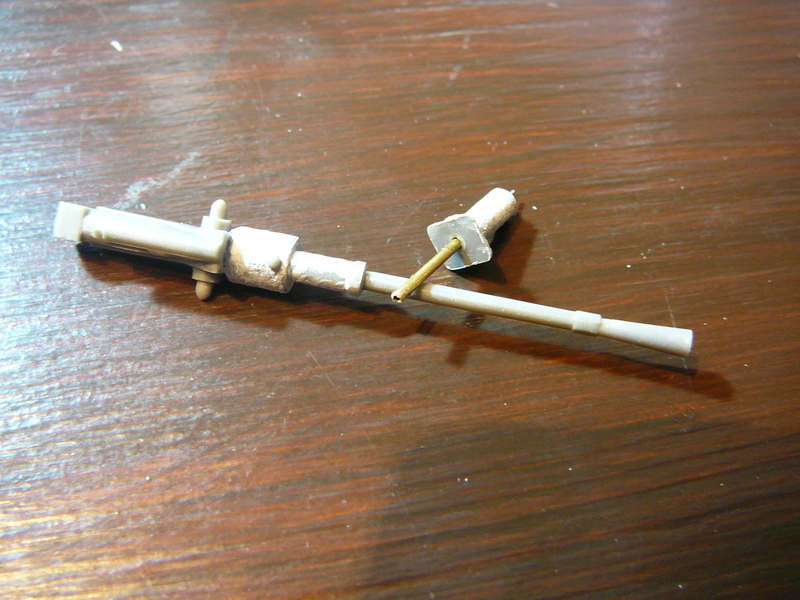 One of these old tricks: combining parts by using rods. As the plastic of this old kit is very brittle some parts snaped off at first eye contact. One of these was a front axle. 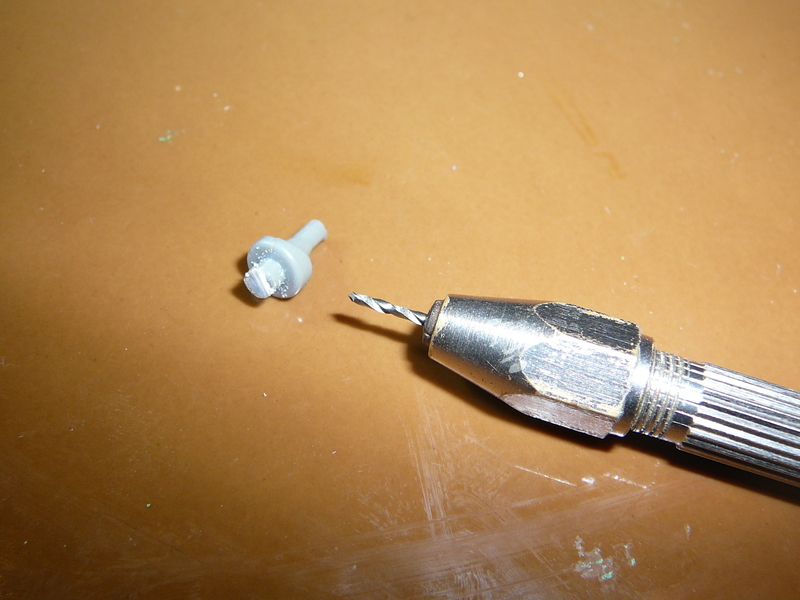 To repair the mess I first drilled a hole with an appropriate diameter into the loose part using a hand drill. Then I repeated the process on the remains of the axle molded onto the chassis. 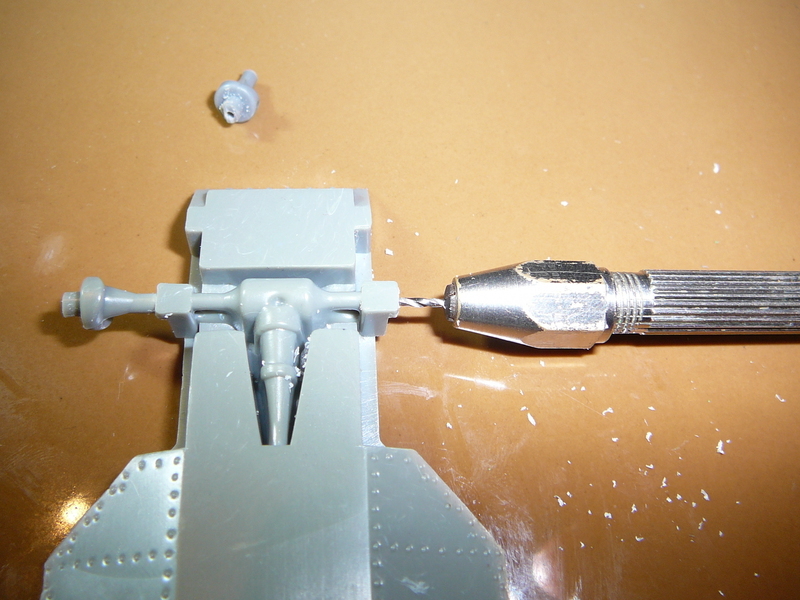 Then I glued a short piece of plastic rod into the hollow axle. 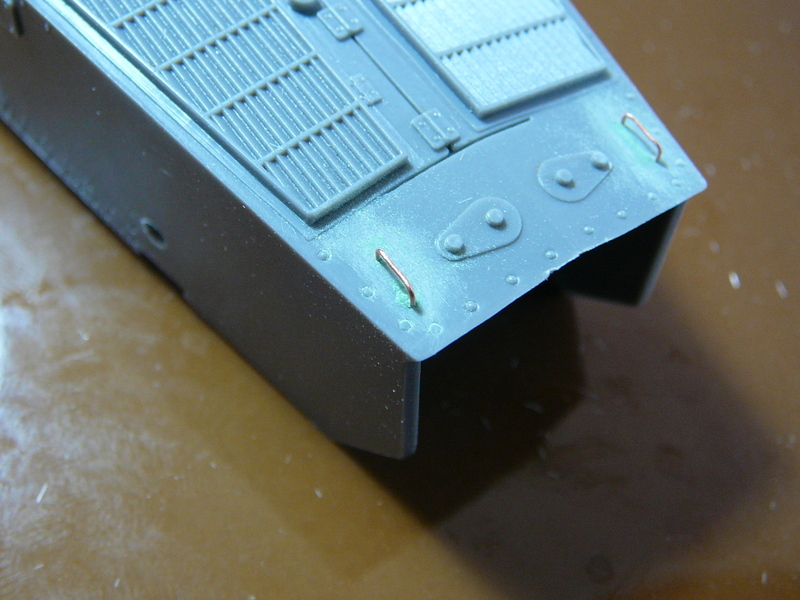 Finally I glued the two parts together using Tamiya Extra thin. 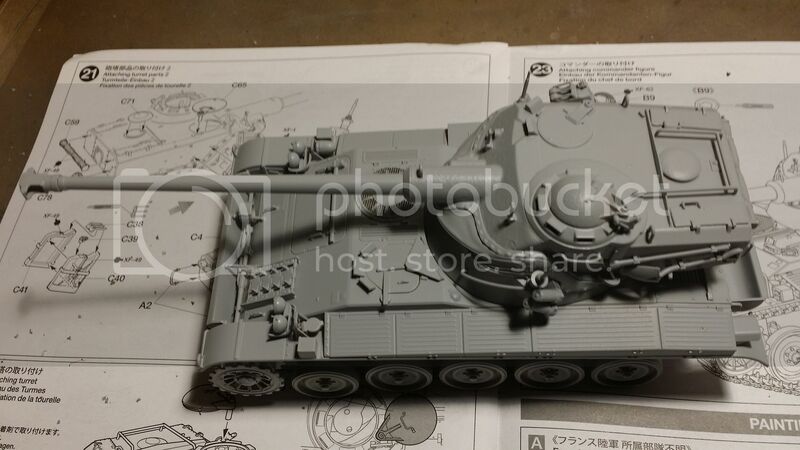 I'm entering with Meng's AMX-30B2. Apologies for the potato quality photos, but I was eager to get started on this. The hull tub immediately struck me as very ambitious and very nicely done. 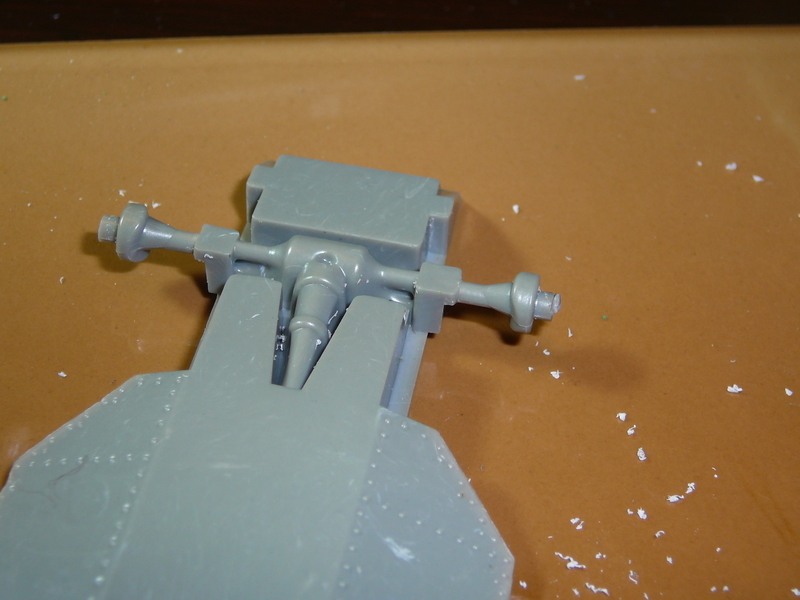 The workable suspension parts in place. 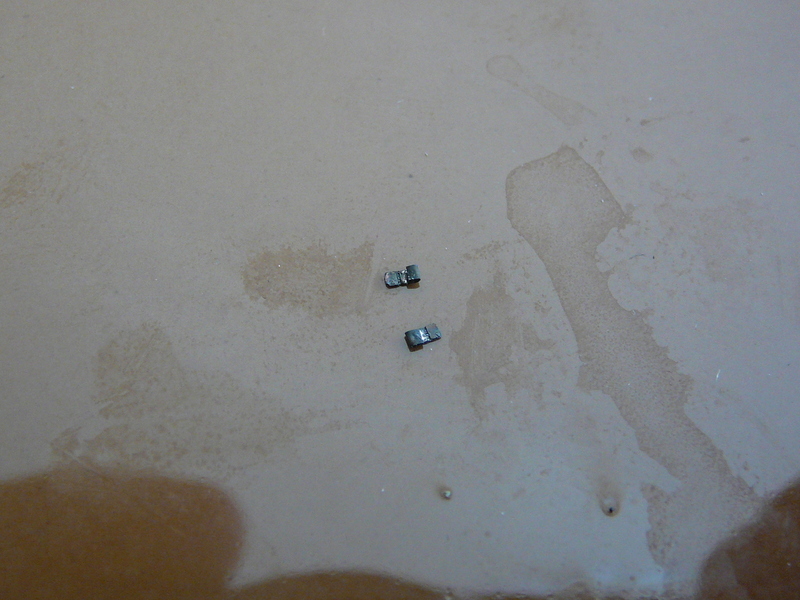 Probably I will glue them into a fixed position at some point. Test fit of the upper and lower hull. 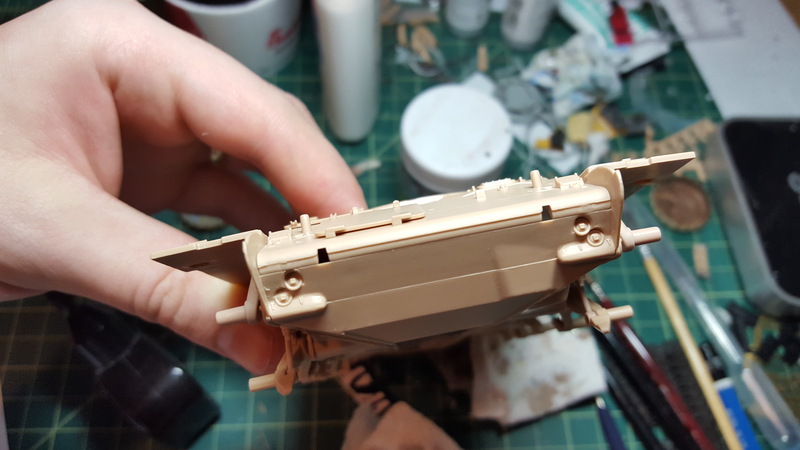 This gap was so prominent that I assumed for a while that there must be some sort of reinforcing strip that ran along the front, but after looking at some photos it looks like a smooth casting, so this will take some work to fix. Which I started with some milliput. The kit is going together fairly well so far, though I am honestly a bit surprised at how much flash there is and how many large mold seams need to be cleaned up before parts will fit. 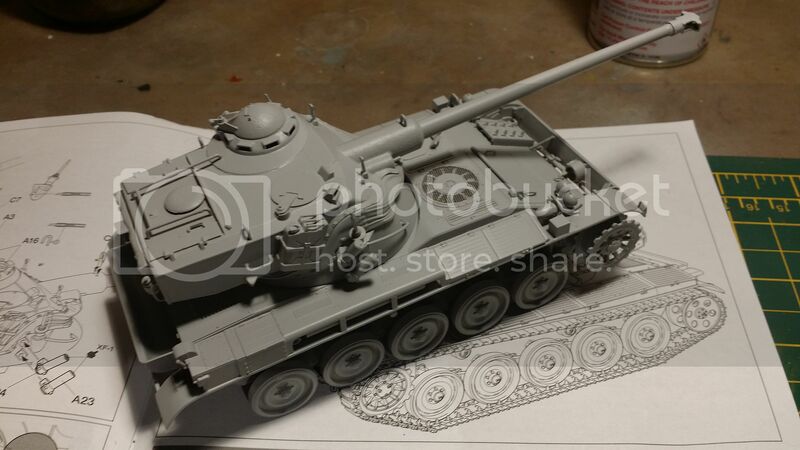 I get the feeling that Meng was a little over ambitious with some of their slide molding here, and I'm wondering if this is one of their earlier kits. I recently finished their Whippet and that kit had none of these issues. Also, I have been having some trouble finding good operation Daguet reference photos. The same two always seem to pop up, along with some grainy youtube videos. Anyone know a good source? I would be especially interested in seeing a tank traversing some uneven terrain, maybe I can put the workable suspension to good use. Brenden,good start on an interesting vehicle. 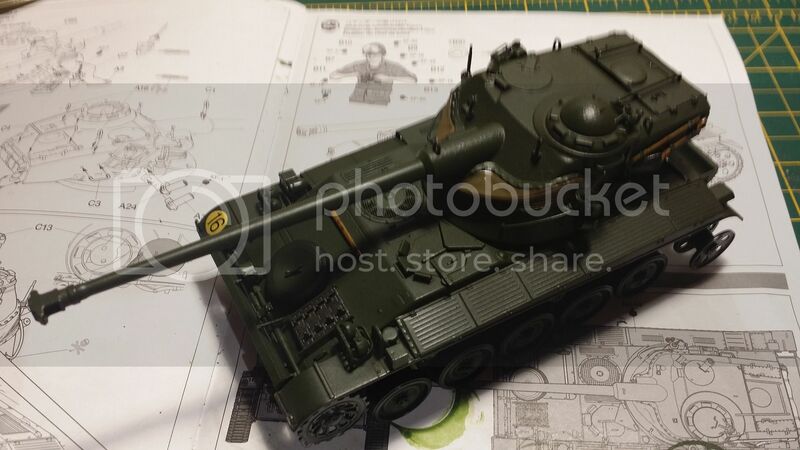 When Meng released their FT, I bought a couple as I reckoned that given the widespread use and the different versions, I'd be sure to find something interesting. First one I built as a 37mm-armed FT in German service in Normandy. 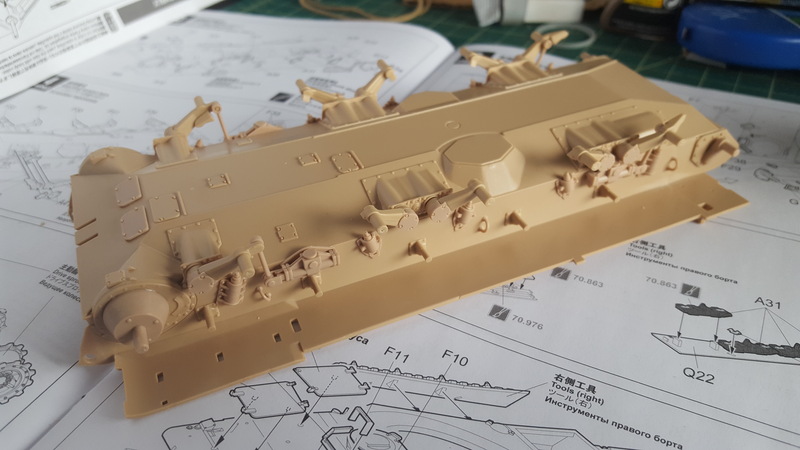 A really nice kit that went together well and had a lot of nice detail. Enjoyed it enough to buy another. When this campaign started it prompted me to do another, in fact two- one with the Reibel MG and another 37mm-armed version. 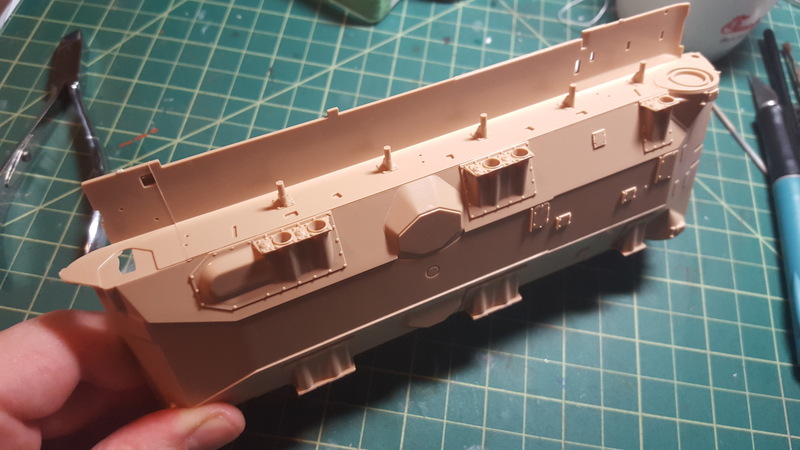 I thought I'd push the boat out a bit with both and add a few bits and pieces, including some of the new 3D printed parts from ETS35 (Niels Henkemans). Moving right along,base coat,glosscoat,and decals are down,next up some washes and weathering. Looks great Anthony! That kit is going to be added to the stash for sure! I have made a little progress myself. Got the base color down. 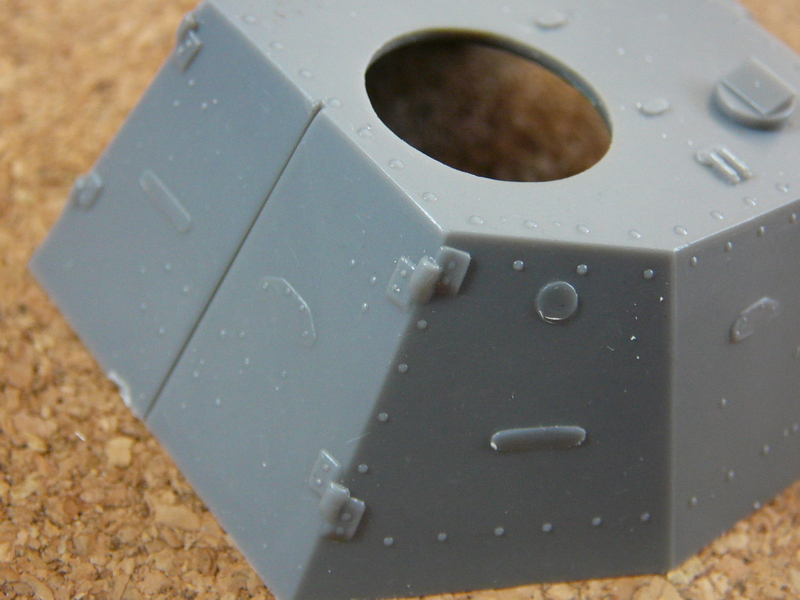 Blocking in the stowage now. 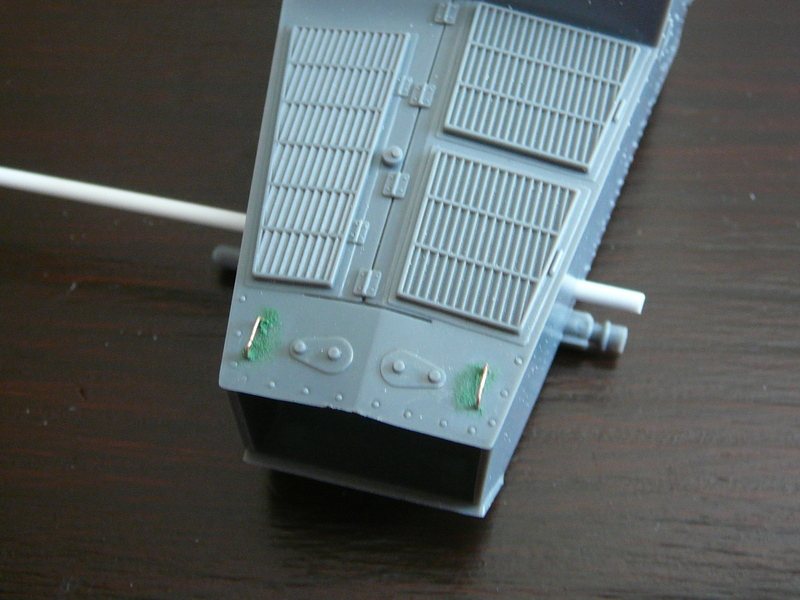 I still have a lot of packs to add to the bar around the turret and may be some more gear on the engine deck. Lots more hand painting to do then sealing, decals, and washes. OOPS! Wrong campaign! Sorry folks I can be a bit slow at times. Dennis, that's amazing work you're doing. 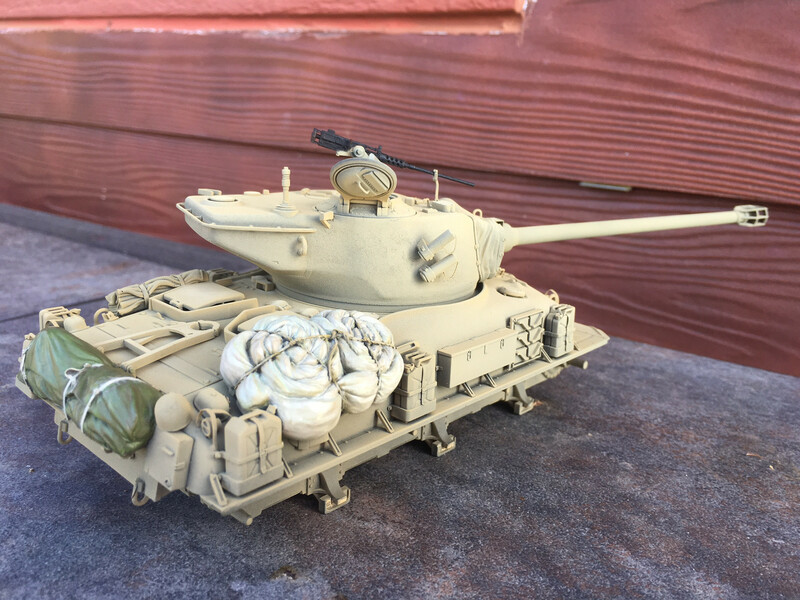 I'm jealous of everyone's progress, with two small kids at home there have been nights where I've literally only been able to glue two parts together on the Chaffee.